Top » Catalog » Forestry » Index and distribution of chesnut (Castanea sativa Mill) traditional cultivars in Galicia. Index and distribution of chesnut (Castanea sativa Mill) traditional cultivars in Galicia. 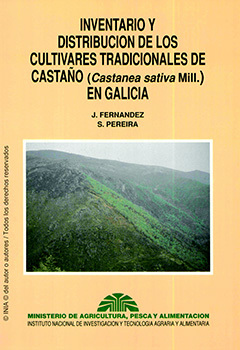 The index of traditional cultivars of Castanea sativa Mill in Galicia has had as main objective defining which the cultivated varieties are well as their diffusion area. An Index of variety denomination, their distribution area, and their variety distribution by councils are shown. In provides information about 65 Councils, from the sea level up to 1.200m. The productive time is from 26th September to 11th November. There is information about 143 Cultivar Denominations.